The official selection at a major film festival is further proof that the latest crime drama game from Rockstar straddles the line between videogames and movies. One could say that gaming conventions like E3 and GDC are to the gaming industry what the Cannes or Tribeca Film Festivals are to Hollywood. And while there might be a few movie properties showcased at E3, like say Tron: Legacy, it usually only occurs if there's a videogame tie-in being announced. The reverse of a videogame being presented at a major Film Festival almost never happens, even if there is a tie-in. That is, until now. Rockstar and the Tribeca Film Festival, started by Robert De Niro back in 2002, announced today that L.A. Noire will be the first videogame honored with an official selection at the prestigious event. Rockstar will present an "interactive screening" of a single criminal case from the game, and hold a Q&A session afterwards. The screening will happen in New York City on April 25, 2011 and Rockstar is pumped by the reception its game will hopefully get. The game itself is out May 17, 2011. 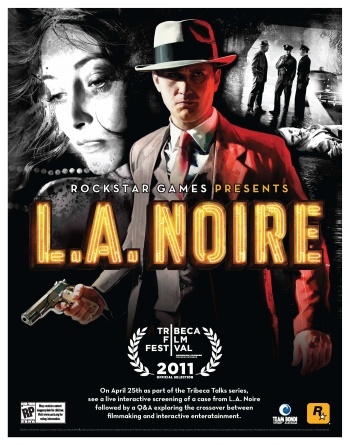 "We're thrilled that L.A. Noire is being recognized by the Tribeca Film Festival in this way," said Sam Houser, Founder of Rockstar Games. "It's a real honor, and another step forward for interactive entertainment." For the Film Festival, including games under its ouvre seems like a logical step in the evolution of the meium. "What Rockstar and Team Bondi have accomplished with L.A. Noire is nothing less than groundbreaking," said Geoff Gilmore from the Tribeca Film Festival. "It's an invention of a new realm of storytelling that is part cinema, part gaming, and a whole new realm of narrative expression, interactivity, and immersion. We are poised on the edge of a new frontier." From what trailers and gameplay I've seen of L.A. Noire, the technology used to display an actor's face in the game is really impressive. It might be the first time that a game truly claws its way out of the Uncanny Valley, and gameplay that encompasses more policework than running and gunning will be refreshing. More than a few of us at The Escapist offices are excited for the game and it's definitely cool that people outside of the gaming industry are just as interested. I hope the screening at the Tribeca Film Festival sways people into respecting games as an art form on par with cinema or literature. Is Roger Ebert attending?